Refugee professionals bring skills and experience, new perspectives and creativity to your workforce. They bridge your skills gaps and help meet your inclusion targets. It makes business sense. UK’s refugee professionals represent an untapped pool of highly skilled graduate talent. 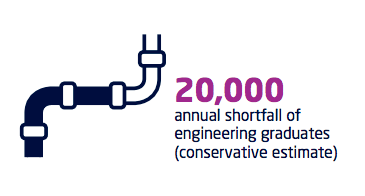 They’re one of the keys to bridging UK’s engineer skills gap. Our candidates have full permission to work and are specialists in their fields. For example, architecture, urban design, building services, electrical and structural design, accountancy, HR, data and financial analysis, and engineering project management. We source engineering talent and build diverse teams for our corporate clients, bringing fresh ideas to adapt to changing business needs. At Capgemini we want to build a workplace that reflects the diversity of our clients and sound data shows that diversity of thought is what drives companies forward. Ultimately we know diverse teams have a positive impact on company performance. Our candidates bring specialist industry knowledge and appropriate transferable skills from around the world. All hold Degrees or Masters qualifications. Most used British, American and Canadian standards in their countries of origin, working on international projects. And around 40% of our candidates have qualified again in the UK with additional Degree and Masters qualifications. They can bring an intimate knowledge of international markets and a global outlook to teams, allowing employers to better serve the societies in which they operate. The right mix of people enables new ideas, anticipates market trends and makes organisations into thought leaders in the market. Our candidates bring new perspectives that can enhance the versatility, creativity, and performance of the teams they work with. Our candidates are committed to their professions. Our case studies show how quickly they make an impact and add value. Tapping into the refugee professional talent pool by using Transitions is an efficient and quality way of meeting diversity and inclusion targets. Corporate Social Responsibility is something we feel passionately about - but we are just as passionate and confident about your return on investment. You pay our internship agency fee and you pay the intern at least the London Living Wage (2019: £10.55 per hour). It’s a trial-run salary to minimise your risk, and it gives the candidate a chance to shine. We know that the best creative and innovative thinking for our clients comes from individual diversity and a supportive dynamic work environment. There’s no obligation to hire at the end of the internship - that depends on the market. When our candidates complete their internship, they have a good understanding of the organisation and they have the skills and experience to keep adding real value. The internship support service is efficient and it works. If an intern is retained, our social enterprise fees are high value for money, and transparent with no hidden extra costs. Our internships provide skilled employees with high rates of retention -- find out more about our internships work or get in touch to start working with us today.